There are things you can never ignore. At times, you wish you’d forgotten; crab hunting, kissing in the wind, eating peanut butter and jelly sandwiches, drinking beer by the bottle, killing flies, licking icy popsicles. Other times, you’re simply happy to remember; stepping into Pierre Hermé’s kitchen, signing my apprenticeship contract, taking a plane to a new life, biting into a perfectly chewy spinach and cheddar muffin. It was a Saturday or Sunday – the day does not matter – of an early autumn morning. I had just arrived to London. The air was crisp and the sky just turning blue after a night made of blankets and raindrops hitting the windows. Somehow, those pretty rustic muffins felt fitting. Right that second, I could smell vanilla frosting and feel the warmth from a just-opened oven door. And by all means, I could hear words from happy people. I remember how the first bite burnt my tongue. I remember the heat of pepper, the flavour of onion, spinach, cheddar and perhaps even Portobello mushrooms. And the crumb. And then, in between creating desserts and reading books, I forgot about this moment. You know, that everyday-kind of happiness. But as autumn sneaked on us – in a rather unexpected manner – the frosty mornings and dark evenings made our house feel like home. A home with soft lights, throws on the sofa, a whistling kettle, and muffins in the oven. Adapted from the Hummingbird Bakery. I could express my love for these muffins through an extended description of their qualities. The bold flavours, the perfect chewy crumb. But the fact that they are equally delicious for breakfast, lunch or dinner – preferably with a side of piping hot soup, makes them my favourite in the world. Preheat the oven to 170°C. In a pan, melt the butter over medium heat and cook the sliced onion until soft. At the end, grate the garlic and throw the chili into the pan and give a good stir to combine the flavours. In a bowl stir the flour, baking powder, pepper and cheddar. In another bowl, whisk the milk and egg together, then pour onto the flour mixture using a wooden spoon to fold. The batter will be quite thick, and I must admit I like to use my hands to incorporate the cooled onions and spinach. Divide into twelve muffin-cases and bake for 35 minutes. Remove the muffins from the tin and allow to cool on a rack. You craft such amazingly wonderful descriptions. Those muffin papers look so pretty. I must ask – are those just pieces of parchment paper placed in each tin? Any helpful trick/tips to keep in mind. Do I need to butter them or anything? You have a way. So beautiful! Tu es bien le seul blog que je vais lire même quand je suis malade. Foodbeam is like a relief to my darn flu. Thanxxx. Idem me de mon cote. Je suis malade puissance dix et je viens juste de feuilleter ton blog: envie de gateau a l’orange et de clam chowder. Avant de mettre un film et me glisser sous ma couette sans meme jetter un oeil a mon reader qui est en train d’exploser de blogs non lus pour cause de rhume. Made the Granola yesterday – it is the best granola I had ever had. I can’t believe I used to buy ready made granola before that, no more. Will try the spinach over the weekend, sounds perfect for the w-end brunch or something. I have a bad cold and the thought of these muffins made me feel better already. I tried salty muffins for the first time recently and loved them. Your photos and writing of autumn and our need for comfort are wonderful. Ces muffins ont l’air délicieux et bien équilibré. J’en picorerais bien un depuis sous la couette ! beautiful post and muffins! 🙂 yeah those everyday kinda happiness sometimes can be taken for granted huh? What lovely descriptions of moments past. And even lovelier muffins to boot. I love the presentation of baking them in squares of parchment paper. A nice twist on some of my favorite ingredients that I can’t wait to try. 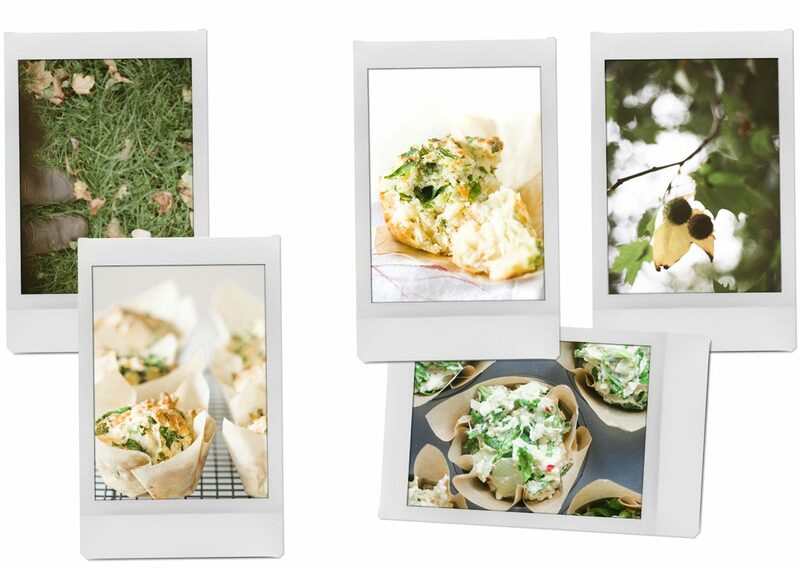 I’ve been looking for a savory muffin recipe and yours makes me want to reach in and grab ti! I can’t wait to try them. Ca m’en met l’au a la bouche, je l’avou. Your blog is very cute. I add you as favorite ! J’aime beaucoup tes muffins moi aussi! L’association des deux me donne l’eau à la bouche! très gourmands muffins! pafait pour un panier pic nique meme s’il fait bien trop froid pour sortir! would love to have one of these for breakfast! looks delish! To imagine tomorrow’s spinach and ricotta gnocchi cooking in hot water. To imagine spinach muffins in the oven. To imagine green tongues and teeth because of too much spinach green. To taste while it rains. i love ur website is awesome…… did u use flilo dought in this recipe????? I have loved your website for quite sometime. Just wanted to finally say thanks for all the wonderful inspiration! You must try this cake !! It is the best of SAL DE RISO. Translate it with reverso on line ..
-2 Kaiser pears, diced and cooked in a syrup of water, sugar and juice of 1 / 2 lemon, then all reduced to a purée. Caramel-wires made by boiling 100 grams. with 50 grams of sugar. water without stirring until everything is brown. Mix the butter with sugar and cream mount. Mix the flour and hazelnuts and add to butter mixture alternately with the egg white and sugar. That is, add a little flour mixed with hazelnuts, then a little egg white and so on, to the mixture of butter and sugar. Mix well and put in two greased cake tins about 28 cm. in diameter and bake at 180 degrees for 20 minutes (must be golden). Allow to cool. Whisk the cream with the sugar, ricotta and lemon juice. Dial the cake by placing a wafer at the base, cover with half the cream filling and spread over the pear puree. Put on top of the other pod and cover with remaining filling. Place cake in refrigerator for at least two hours but it would be better prepared the day before. Take up the cake from the refrigerator and decorate the edges with whipped cream and fresh juice from a syringe to the nozzle with a star. Cut the slices of pear slices left attached to the tip (do not cut the slices at all) so you can open them and place them in a radial pattern at the center of the cake. Thank you for this recipe, Fanny! I made them this morning and had them with salad for lunch – They’re delicious! I swapped 100g of the flour with spelt flour. Love the texture! I’ve just got two things to add: The muffins could use a pinch of salt (I was too sleepy this morning to think of it myself), and one should definitely go for your parchment-paper-lining(?) option instead of using the usual paper liners (they’re super sticky with this dough). These muffins would be amazing with a really simple creamy soup – like Cream of Mushroom or Cream of Asparagus. The muffins are a little more complex in contrast to a very simple soup. Nice winter lunch. I can almost smell those spinach cheddar muffins. Almost. I’m not really into eating spinach but your recipe for ‘Spinach and cheddar muffins’ looks really yummy! I’m glad you’ve shared the ingredients and your whole recipe. Thanks for letting your visitors know another ultimate snack that we can truly enjoy cooking and eating! Delicious looking muffins! Your photography is breathtaking! I also just drooled on my keyboard a bit. YUM! Love the way you write, Fanny. Your posts always make me smile. When do you add the spinach? do you cook the spinach first?? please EXPLAIN!!!! I dont eat egg? can we use anything else instead of eggs in spinach and cheddar muffins? There is just no mention of when to add spinach…whether it needs to be cooked or cut fine or what is to be done with spinach? And u have mentioned about preheating the oven, but is it at the same temperature the baking needs to be done or does the temperature have to be increases? Please clarify. Ils sont vraiment parfaits, j’ai adoré et du coup j’en ai déjà fait deux fois cet été! Merci beaucoup, ça va être ma base de muffins salés maintenant!